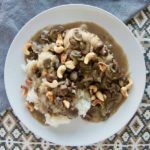 Calypso Chicken is a savory and flavorful chicken stewed with mushrooms, onion, ginger, red wine and spices and served over rice, and is a typical meal from the Caribbean island of Dominica. Not to be confused with the Dominican Republic, the Commonwealth of Dominica is a small island situated between Martinique and Guadeloupe in the Lesser Antilles archipelago in the southern Caribbean Sea. The island was named for the day in which Christopher Columbus came to the island: “Domenica”, or “Sunday”. The small island of Dominica is a cultural melting pot of native Carib, British, French and African people and its cuisine is exemplary of this mixture of cultures. Traditional Caribbean foods such as plantains, yams, rice, and peas are typically stewed with chicken and foods like ginger and thyme to create a distinctive Dominican flavor profile. Calypso Chicken is a prime example of this mixture of cultures and the cuisine of Dominica. Chicken is the most common meat consumed on the island of Dominica, and is typically stewed with vegetables and spices and served over rice. 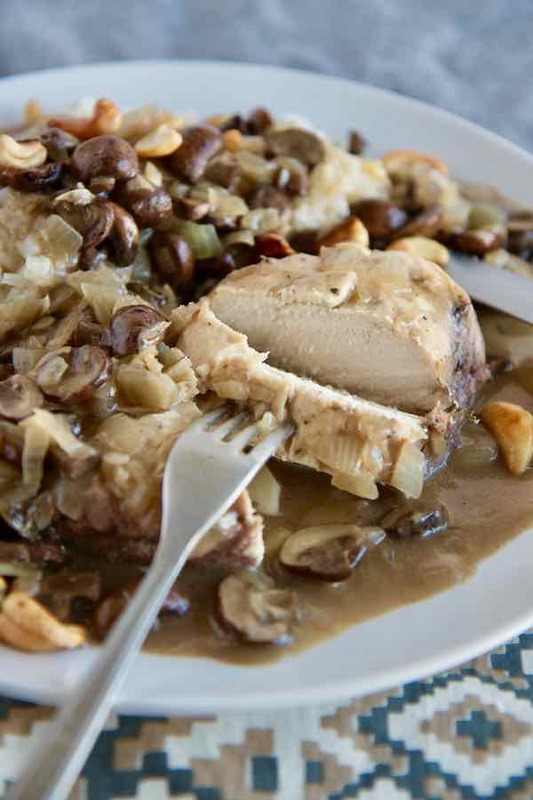 Calypso Chicken is a dish of chicken breast, garlic, mushrooms, ginger, onion, red wine, spices and fried cashews and is a great example of the typical savory chicken dishes of Dominica. “Calypso” is a type of Dominican music that was popularized in the mid 1900’s but originated during the times of slavery. Performed in tents, the music was originally a mixture of Afro-Carib and French Creole music but evolved as it took on influences from Trinidadian music culture and the reggae sounds from Jamaica in the 1950’s and 1960’s. Today, calypso is not only the music from Dominica, but the word also describes the cuisine from the Caribbean island. 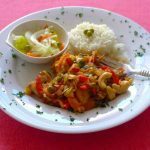 While calypso chicken is an example of the popular chicken and rice dishes in Dominica, the variations are endless and many takes on the recipe will include different Caribbean ingredient influences. However the foundation of the recipe, and many of the popular dishes in Dominica, is chicken stewed with vegetables and served over rice. 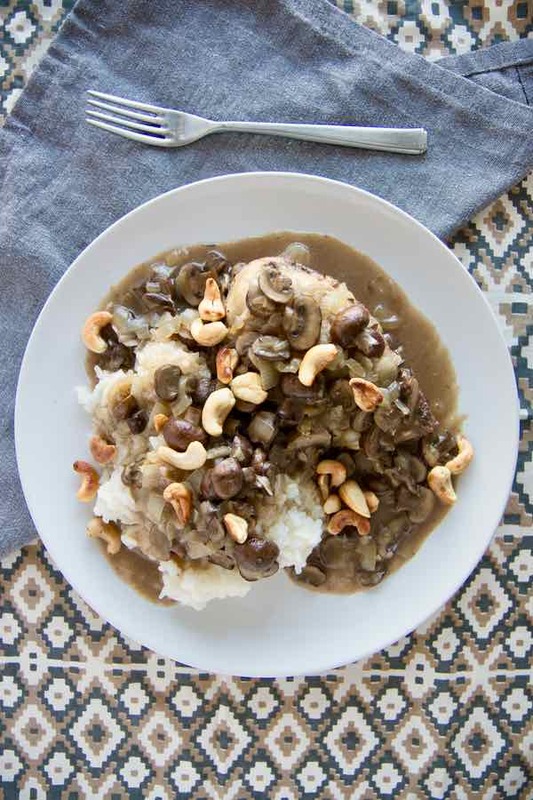 The calypso chicken shared here is one of the most traditional variations: chicken breast, mushrooms, onion, ginger, red wine, spices and pan-fried cashews. Other variations include lime juice, raisins, pineapple, worcestershire, carrots and peppers. The influence of both native Carib and colonial ingredients and flavors can be seen in the dish’s many variations. 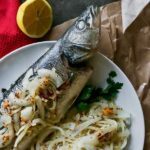 With influence from both native foods and those brought from England, France, and Africa during the colonial era, Dominica’s cuisine is a perfect example of Caribbean fusion. 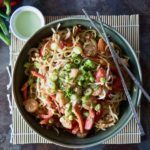 With a strong focus on bold flavors like ginger and lime, and borrowed flavors like jerk seasoning from Jamaica, Dominica’s dishes are sure to hit the spot. Chicken is the most popular meat served in Dominica and is typically served stewed over rice. However, while the national dish of Dominica may be called “Mountain Chicken”, it is actually a play on words: the dish features stewed frog logs from a type of frog only found on the island’s mountains in high elevations. Other foods typical of Dominica include saltfish, cornmeal or polenta porridge, fried plantains and many stews and soups made from meat or fish with vegetables. Roadside food stands are popular throughout the countryside and sell fried chicken and fish and an array of exotic fruits, such as bananas, pineapples, guava, coconut and mango are sold whole and mixed into smoothies. 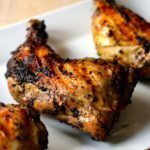 While marinating the chicken takes a few hours to capture the traditional flavors of Dominica, Calypso Chicken is a relatively easy dish to make. Typically served with rice, polenta or other grains, the recipe can be made in large portions and stored for up to five or six days in the refrigerator or even longer in the freezer. 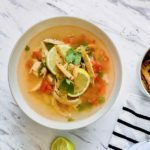 This calypso chicken recipe is an easy way to take a trip to islands and to savor the ingredients of the Caribbean. 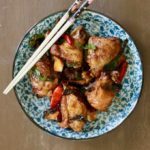 We hope you enjoy our take on Dominica’s typical calypso chicken dish and please let us know your own ingredient variations! 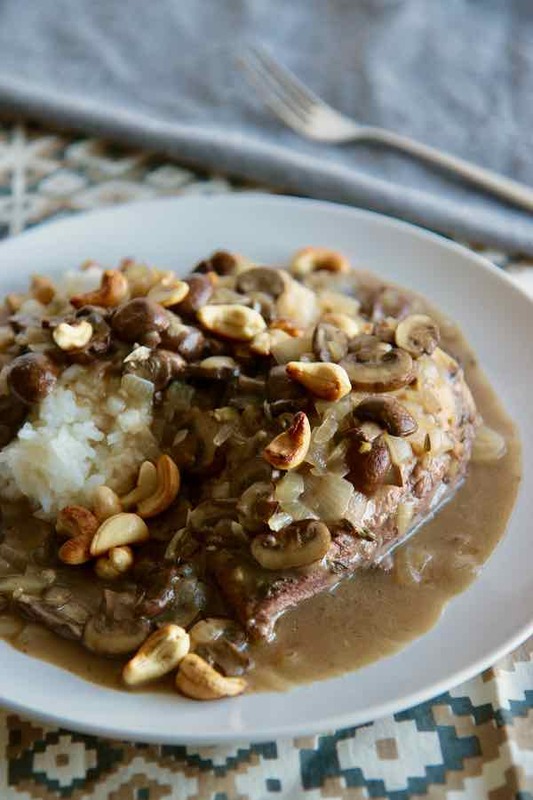 Calypso chicken is a delicious traditional recipe from Dominica where chicken breasts are marinated before being cooked with mushrooms and cashew nuts. In a large container, combine the chicken breasts, thyme, vinegar and a 1 crushed garlic clove. Season with salt and pepper. Mix well, cover and marinate in a cool place for 5 hours. Drain the chicken breasts thoroughly. Heat 3 tablespoons of oil in a non-stick cooking pot over medium heat. Melt the brown sugar in this oil, then brown the chicken breasts on high heat, turning them regularly. Remove the chicken breasts and set aside. Deglaze the juices of the saucepan with the wine and half a glass of water on medium / high heat. As soon as bubbles first appear, lower the heat to maintain a small boil. Add the chicken breasts, and cook for about 20 to 25 minutes until the chicken is tender. Pour 2 tablespoons of oil into a frying pan and, without waiting for the oil to warm, add the cashew nuts. Fry them for one to two minutes or until they get some color. Remove the cashew nuts with a skimmer and place on a plate lined with paper towel. In the same pan, add 2 tablespoons of oil and cook the onion, the remaining garlic clove, the fresh ginger and the mushrooms over medium heat for 10 to 15 minutes. Add salt and pepper. Add the chicken breasts and their cooking juices. Whisk the flour in 3 tablespoons of cold water and pour over the chicken. Mix well. Simmer over low heat for 20 minutes. About how many calories in the entire amount prepared in the recipe for Calypso chicken? Not sure Ken. One thing we can tell you is that it is a rather healthy dish. Cashew nuts provide a lot of nutritional benefits. You can reduce the amount of sugar, wine and flour if you’d like to make it a little healthier. I was curious because for about six months I was living on the island and had limited access to anything other than chicken rice yams msngos plantains some fish virtually no bread or sugar added items, and had about five percent body fat, albeit I was snorkeling way off the beach very frequently as well. I was in the best shape of my life. That deteriorated when I left there. My New Years resolution is to simulate that by going to the pool and changing to that type of diet.